Last night we settled down after tea to watch some telly and decided to watch a documentary about 9/11 and some of the people who died in the collapse of the towers. The programme took a look at some of the people who jumped from the towers rather than be burnt alive within. The official line on these people has always been that these people didn’t jump – because that would be considered suicide – but rather they were blown out of the buildings by fire or explosions. This is an understandable position because many religions consider suicide to be a sin and it also saves the relatives of those who had “fallen” from thinking their relative had suffered; maybe they had been killed in the explosion that threw them from the building. 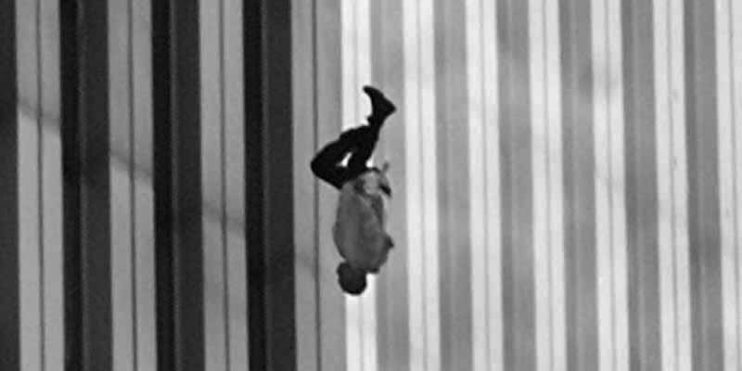 The next day, the New York Times published a photograph of a man falling from the North Tower; he became known as “The Falling Man”. The photo’s caption read; “A person falls headfirst after jumping from the north tower of the World Trade Centre. It was a horrific sight that was repeated in the moments after the planes struck the towers.” It appeared only once in the Times because of the criticism and anger which emerged following its publication. The identity of the subject in the photograph has never been officially confirmed. The fact that so many people were trapped in the tower has made identifying the man in the 12 photos difficult. The Globe and Mail reporter Peter Cheney suggested the man may have been Norberto Hernandez, based on his research, but, when Hernandez’ family closely examined the entire photo sequence, they did not feel that it was him. Three other families claimed the man as a relative, but careful analysis of the photo confirmed the claims to be incorrect. “The Falling Man” is also the title of an article about the photograph by Tom Junod that was published in the September 2003 issue of Esquire magazine. The article was adapted as a documentary film by the same name. The article and film also reveal “The Falling Man” may have been Jonathan Briley; known to have worked on the 106th floor of the north tower of the World Trade Centre. He either fell accidentally from the restaurant on that floor while searching for fresh air and safety, or decided to jump. What struck us about the documentary we were watching was that nobody wanted “The Falling Man” to be their relative. It was like everyone was disowning him because of the stigma that everyone would know he had jumped thus committed suicide. The deeply religious family of Norberto Hernandez – the man who was originally thought to have been the subject of the photograph – refused point blank to even consider that it was him because suicide is a sin in their eyes. Surely no one, even using their wildest imagination, could think that someone given the choice of dying an agonising death in a fire or jumping and hoping against hope that they survive would have committed suicide if they chose the latter. “The Falling Man” was most likely Jonathan Briley, but there is no shame in anything he did that day even if it turned out he had jumped. In fact, listening to all the facts, Jonathan was an asthmatic and would have known he was in danger when smoke began to pour into the restaurant. He may have jumped or he may have climbed out of a window trying to find fresh air to breath and fallen. Whatever he did, and we will never know what that was, he did nothing to be ashamed of or indeed for his family to feel shame in his actions. There can be no blame placed on his shoulders – any blame for that day lies elsewhere! Currently hiding under the blanket nearly crying cause a daddy long legs just flew right past me and landed on my leg:'( someone save me aha?! Imagine how he must have felt standing on the ledge… do i get burned to death or do i die from the fall. Terrible decision to have to take!! That sad moment when you lose a chip in dip, so you send a recon chip in and lose that one too. Got a Petit Filous Pot stuck on my head. Feeling a bit self conscious about the situation. Nowt worse than when you’re halfway through your morning shite and you realise there’s no bog roll. Friday the 13th and I have a job interview :| this will either go really well or so terribly wrong that I will chop myself up and mail myself to Jesus. Stfu! Someone is pushing a dog snoring in a pram!!! I have great time at Blackpool. I even get to try out new cozzie. Yesssss Friday!! Took your time sunshine, been waiting for you. Annnnd Leceister for Sam’s BBQ tomorrow!! Who needs a liver anyway right ? Prove you are Human: What is 8 + 3?